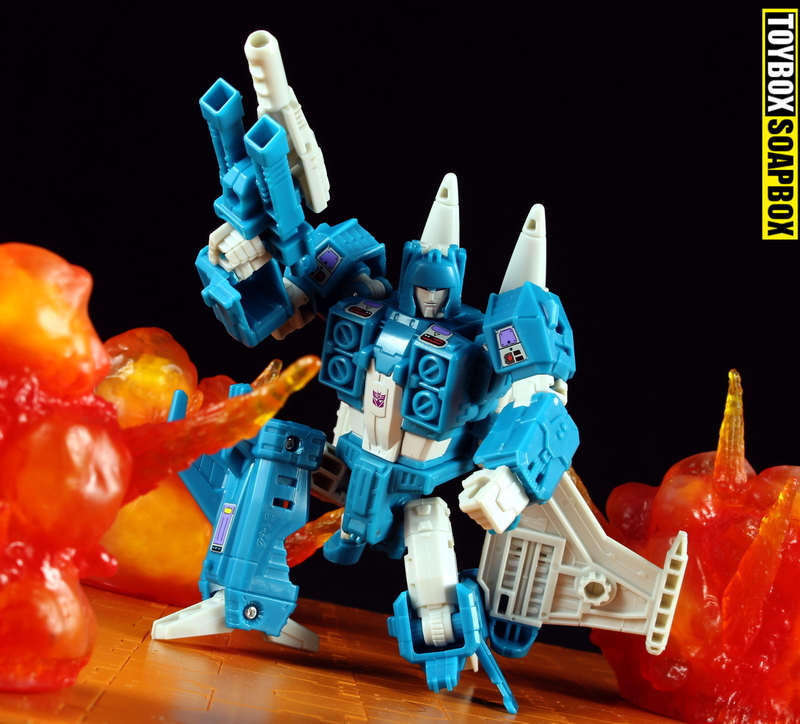 Completing the line up of Decepticon jet Targetmasters, Titans Return draws to a close with one last bang – Slugslinger. The only new toy in the final wave of deluxes, Slugslinger is either going to be tougher to find than three points for Derby County last time they were in the Premier League, or he is going to shelf warm and Toys’R’Us staff will be building Christmas displays out of them. Titans Return has redefined what we expect from retools, so is Sluglsinger another example of that? Lets dive right into the review and find out. 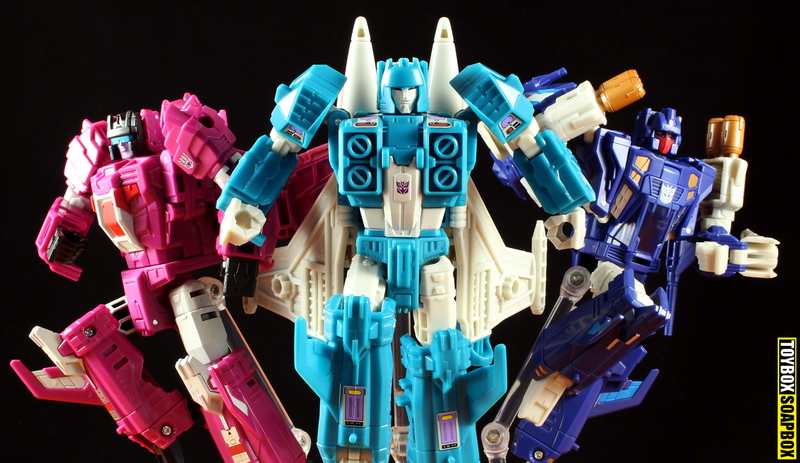 Hailing from parts unknown (or the 1987 portion of the G1 spectrum) Slugslinger lands in the form of a retool of Triggerhappy, though sharing more in common with his fellow retool – Misfire. Hasbro have done a marvelous job in concealing much of the shared DNA between the trio with only the legs obviously being the same on each. They form the rear of each jet and are identical parts but Hasbro have been clever in the use of paint to help them look slightly dissimilar. Aside from that it’s all new, all different. Slugslinger himself is a bit of a conundrum. On one hand he’s more familiar than his mold mates. 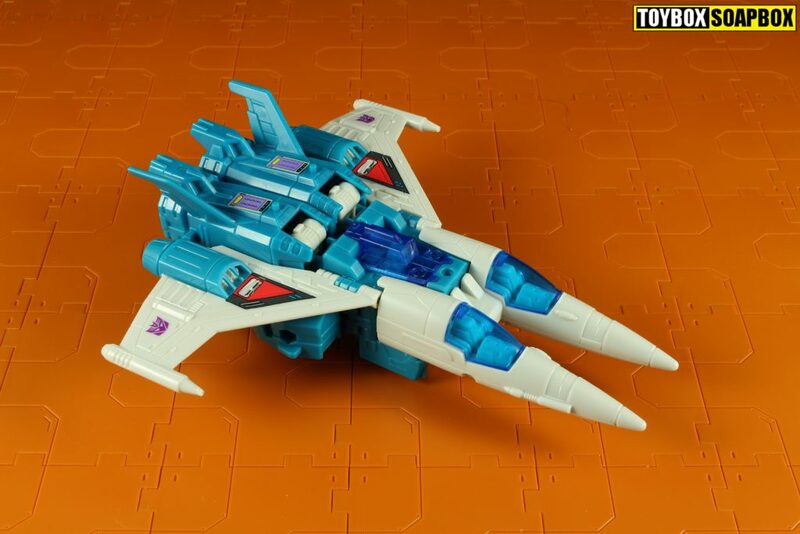 Military grey covers the normalish shaped wings and the nose cone is pointy like a real fighter jet, but the Brucie bonus that makes Slugslinger outlandish is that he has two nose cones. Hold your surprise dear old Sugar Hill Gang, it’s always been Slugslinger’s signature trait. 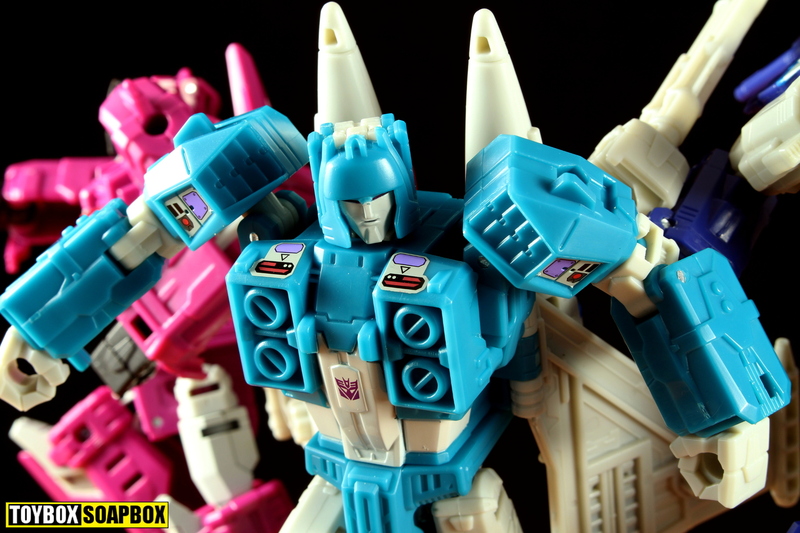 From G1 to Energon, anything with the name Slugslinger attached comes with two sniffers. Perhaps Vector Sigma was going through a bad relationship and felt everyone should have separate cockpits rather than sharing. Starcom (another of Liam’s most favourite toylines) released a toy called the Starhawk which is also a very similar looking twin cockpitted space jet, so perhaps it was a sign of the times. Yes I have a Starhawk on my shelf and yes I love it with the power of a thousand Jennifer Rushes stood in lifts whispering in the morning. Unsurprisingly the Titan Master is unable to fit in either cockpit but it doesn’t stop Hasbro’s designers from sculpting an interior, visible through the blue tinted clear windscreen. 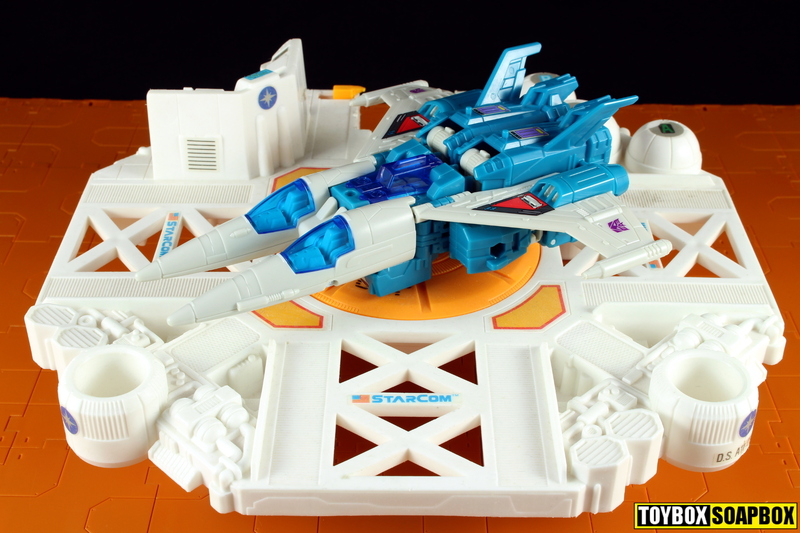 The Titan Master can be seated under a clear flap on the top of the jet in his own little personal space. Normally these interiors are detailed with small consoles, screens, buttons and things that look like they go beep boop beep, but Slugslinger’s is decidedly bare. A job for Toyhax then. There’s no landing gear (if there is I blame it on the rum I am drinking) or any other feature but you can peg the two guns under the wings if so inclined. Sticking them there looks pretty daft though. John Travolta with being levels of daft. So much of this toy has been remolded to look as accurate to the G1 jet mode as possible, with paint details lifted right off the original toy. Even the shared legs fit Slugslinger perfectly. Like many of the figures that have spun out from Titans Return most of the G1 detail carries over but is embellished or reworked to give this toy its own identity. That has been one of the key triumphs of Titans Return, its ability to capture the spirit of the character in a way that many of the prior Classics/Generations figures didn’t always manage. Imagine if Slugslinger had been given a realistic alt mode, the essence of the character would have been lost entirely. Somethings weren’t meant to look normal – and that is Titan Returns forte. I’ll keep the weird sci-fi look with the sleekness that makes it look like it’s skimming across the surface with water and dust blowing everywhere. Or something Hawk and Animal would have gotten around in their adventures outside of a WWF ring. Caliburst is the Titan Master included with Slugslinger and he uses the same mold as Aimless and Blowpipe. It’s exactly the same in every way, bar colour, so put them together and you’ve got your own Crystal Maze team in their matching uniforms. There’s some nice paint on the face and visor but there’s not much else I can tell you so I am just going to go off and play Street Fighter II for a bit instead. Obviously keep reading as time passes differently for me writing this than for you reading it. So on to robot mode (I couldn’t defeat M.Bison on 7 star difficulty). 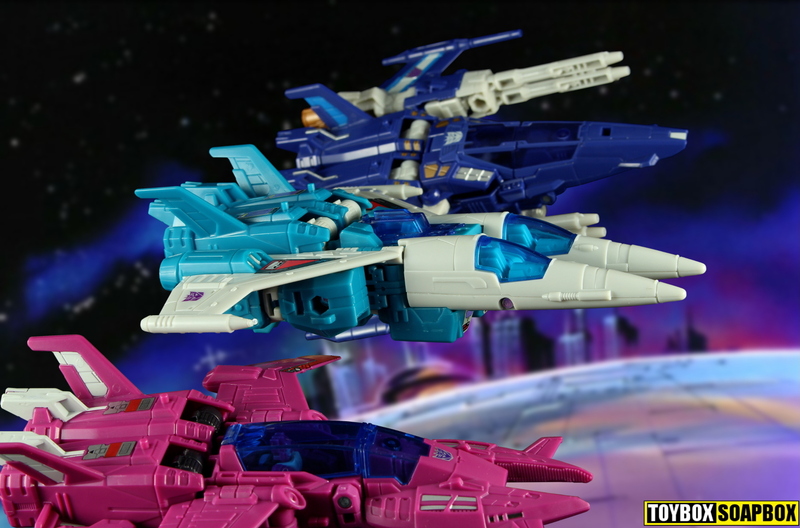 Transforming Slugslinger follows Misfire more than Triggerhappy. 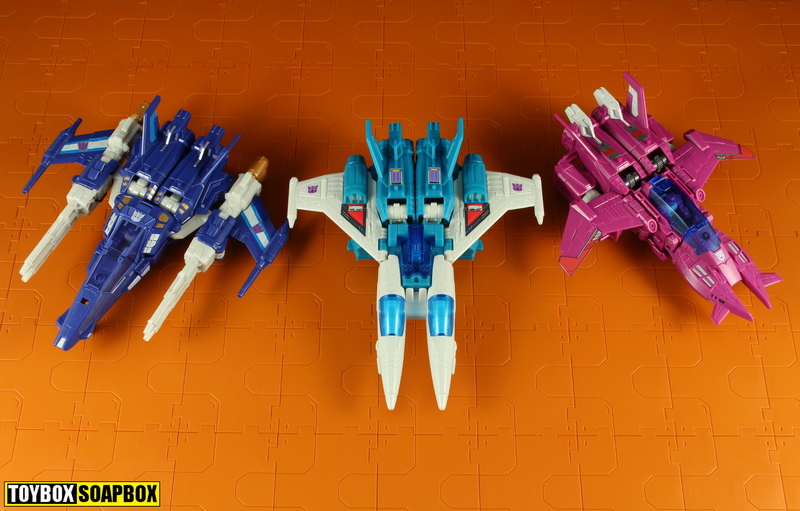 While all three are very similar, Triggerhappy has a unique way of moving each of his parts around in order to get the cockpit onto his chest. Slugslinger and Misfire’s frontage is the undercarriage of their jet modes so they don’t have to resort to that kind of rotational trickery. The front of Sluggy’s jet folds onto his back, the arms hinge up and lock with the legs unfurling like a SNES control pad cable that is all kinked up because someone didn’t wind it properly. Two of Titans Returns greatest strengths have been the ease of transformation and the clever use of retooling – both are in evidence here. A fully transformed Slugslinger is one of the finest examples of a robot you’ll see. The combination of light blue with grey is stunning with both colours complementing each other and providing a cohesive theme through the toy. Other colours crop up but mostly as detailing and there are no baffling choices here that draw your eye in an awkward way, such as the black hips did on the otherwise beige legs of the Hasbro Titans Return Hardhead. The colours on Slugslinger never give off the impression that a compromise was made somewhere. As Slugslinger is the last new deluxe of the line they must have had a bigger budget in order to give him all of the G1 toys sticker details but in paint. If you’ve experienced the foil stickers Hasbro have been loving lately you will be doing Robbie Keane style goal celebrations at the thought of them not being used here. Even the Decepticon badge is accurately located on the stomach. Someone was making an effort and everything…. The sculpt is not an identical reproduction of the G1 toy but it’s so close. Slugslinger’s signature oven knobs chest circles are replicated but sit slightly higher than on the vintage toy in a move that absolutely nobody will care about. Normally Hasbro can’t resist and have to fundamentally change something but no, if you look at the vintage toy most of the details are present and correct in some form. 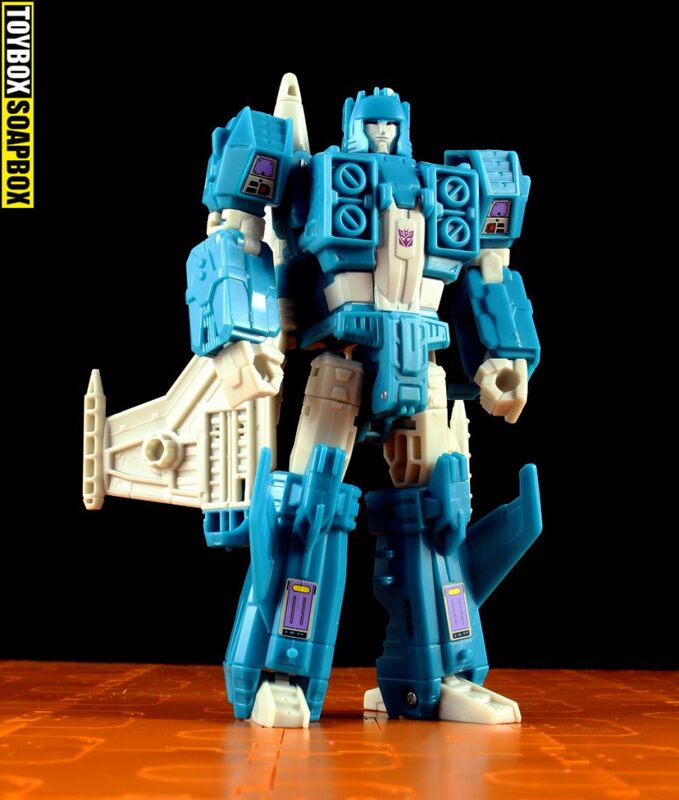 Titans Return Slugslinger’s proportions are more buff and athletic and his crotch looks less like a giant blue nappy but everything else is very accurate. 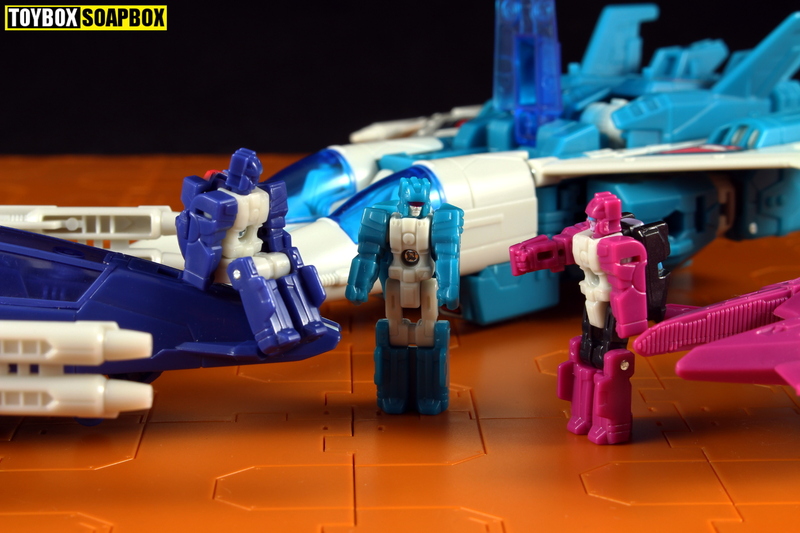 The retool aspect of Slugslinger is only apparent in the legs which are identical to Triggerhappy and Misfire but colours and paint detail do enough to keep your attention away from that. Stand all three together and nothing instantly leaps out as being the same unless you are looking for it. The legs are obvious but there is so much remolding from the waist up and that is what draws your attention. It helps that each is so stuffed with character. One significant change from the original is the head which is inspired by the cartoon. 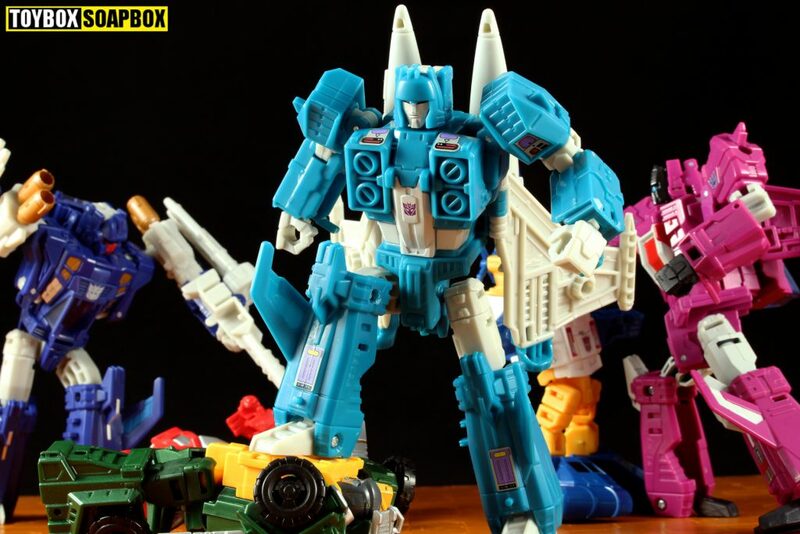 It’s interesting because everything else is trying so hard to be a fancy dress imitation of the original toy and Hasbro have used toy inspired faces throughout Titans Return, leaving Takara to satisfy their OCD for cartoon accuracy. It’s a great face, it really is, but a toy style visor face would have scored the perfect homage to the original toy. 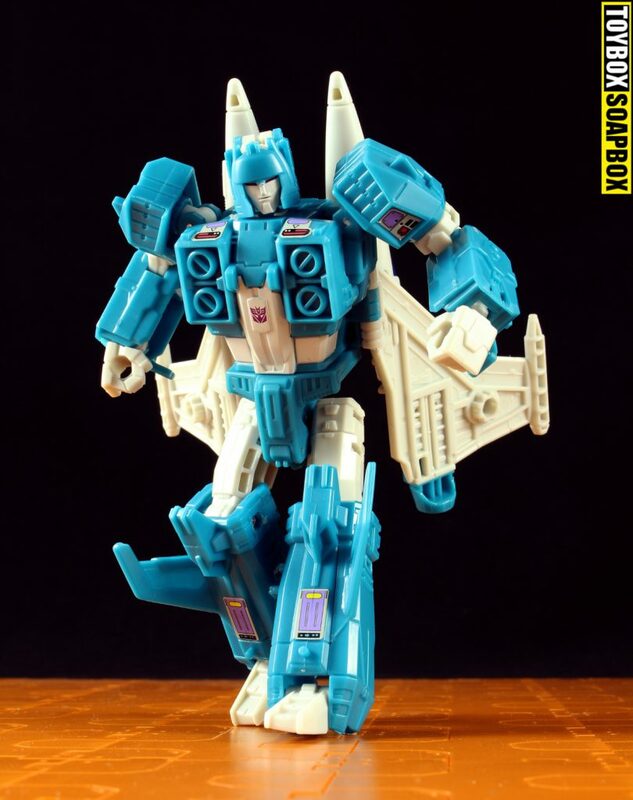 No criticism is justified as that is a personal preference on my part, one full in the knowledge that I also have the Takara toy on order and would love to have my cake and eat it. A silly phrase because who wouldn’t want to eat their cake if they had it? Articulation is decent and if you have any of the other two it’s the same. If you don’t, just know Slugslinger is a fantastic bot to pose with plenty of swivels and nothing is hindered. Mine has no loose joints so can stand or hold up his weapons with no problems. I have spent ages looking over the toy to find something to fill this space but there’s nothing – the QC is fine. Two guns are included and are styled to stir memories of his former life as a Targetmaster. Unusually for Titans Return the guns don’t look large chunks gouged out to form a high chair for a Titan Master. The two guns are actually completely different rather than being mirror images with one being a small grey pistol and the other being a larger blue double gun. A Titan Master can still attach via pegs but it is much less intrusive than the vast majority of prior deluxes. Hasbro seem to have learned that lesson far too late. 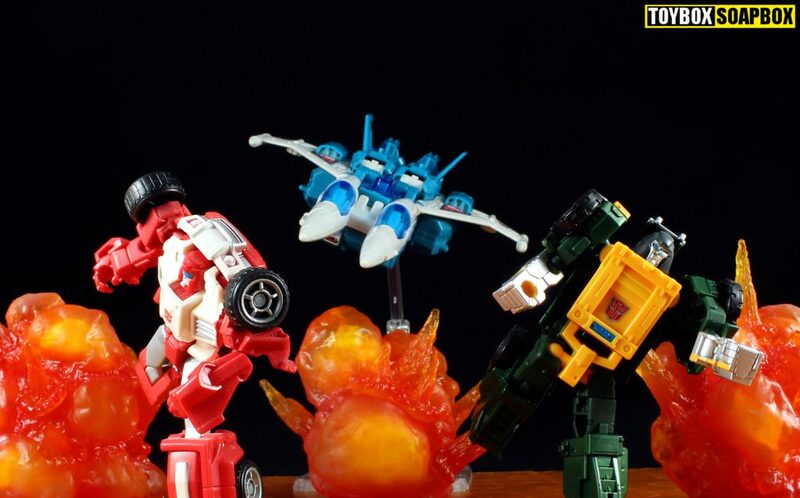 Takara on the other hand are including an actual Targetmaster. Slugslinger is the exclamation point on Titans Return. One last stellar reminder of why the line has been so beloved and everything that it was capable of. A great toy in his own right but almost everything Titans Return was is summed up in this one body. An updated toy of an obscure Transformer, particularly pulled from the 86-87 era, a retool with tons of new moulding and a fantastic toy to boot. When Titans Return started my eyebrows were raised at the prospect of everyone being a Headmaster but in the end it’s given me incredible renditions of characters I thought I was unlikely to see again without my bank manager calling me. Even with Power of the Primes I am really going to miss this line. Sleep well sweet tiny robot headed prince. The sixth picture gives me the feeling of them just chilling out after work. Nice review by the way! Great review as always Mate, love the references and humour. Just wish I could pose my bots as imaginatively as you do! The 3 titan masters hanging out was a great touch. Keep up the good work!